EuroSys 2009 is organised by EuroSys, the European Chapter of SIGOPS, sponsored by ACM SIGOPS, in cooperation with Gesellschaft für Informatik (GI) and the British Computer Society (BCS). The EuroSys conference series brings together professionals from academia and industry. It has a strong focus on systems research and development: operating systems, data base systems, real-time systems and middleware for networked, distributed, parallel, or embedded computing systems. As a highly recognized conference — rank 11 out of 581 in terms of impact factor for 2007 (cf. CiteSeer) — EuroSys has become a premier forum for discussing various issues of systems software research and development, including implications related to hardware and applications. EuroSys 2009 will follow the pattern established by the previous EuroSys conferences, by seeking papers on all aspects of computer systems. EuroSys 2009 will also include a number of workshops to allow junior and senior members of the systems community to explore leading-edge topics and ideas before they are presented at a conference. * Attention: unless defined differently by workshop organizers. Nuremberg, the second-largest city in Bavaria, boasts a unique mixture of the traditional and the modern. Its almost one thousand years of history are still obvious in its cityscape, which prominently includes the Kaiserburg (Imperial Castle) at its centre. What do we associate with the city of Nuremberg? Some people might think of Bratwurst (fried sausage), Lebkuchen (spicy gingerbread) or the Christkindlesmarkt, Nuremberg’s world-famous Christmas market. Others may remember the Nuremberg Trials and the city abused by the Nazis as the City of the Nazi Party Rallies. Others again may think of Nuremberg as a Renaissance city of European standing where artists such as Albrecht Dürer worked, where Martin Behaim devised the first world globe, and where Peter Henlein made a fob watch tick for the first time. EuroSys 2009 takes place on the premises of the School of Business and Economics which is part of the twin-site University of Erlangen-Nuremberg. 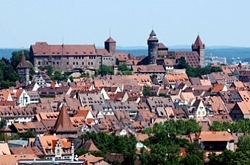 They are located in the inner city of Nuremberg, with major sights like the Imperial Castle in walking distance. The conference venue is very well integrated in the public transport system and reachable by subway, tram, and bus. 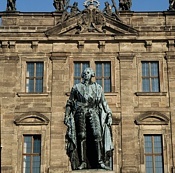 The Friedrich-Alexander University Erlangen-Nuremberg (founded in 1743) is the second-largest university in Bavaria with about 26,000 students. With over 12,000 employees in the fields of science and teaching, administration and the provision of medical care, the university is the most significant centre of research and education in the Nuremberg metropolitan region and the second-largest employer in Erlangen. Organisation of EuroSys 2009 is in the hands of the Chair in Distributed Systems and Operating Systems of the Department of Computer Science. This department was established in 1966 as one of the first of its kind at a German university. 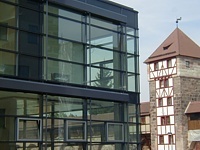 It is one of the five departments which constitute the School of Engineering at the Friedrich-Alexander University today.